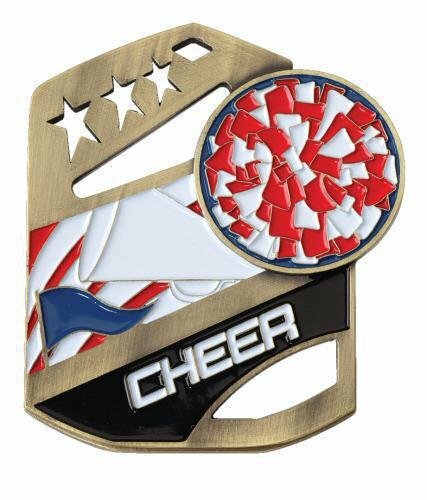 These color medal awards are a stunning rectangular medal with a different look and feel from the standard medal. The recipient of these medal awards is sure to be pleased and be proud to display it in their award and trophy case, or even around their neck. This baseball medallion is truly unique. 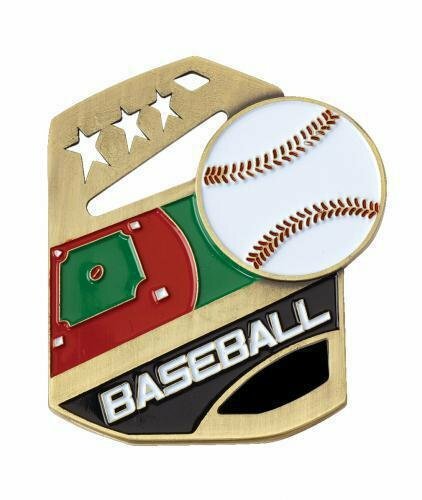 The full color relief of the baseball and the detail of the baseball diamond along with the cut-out of the stars across the top give it a fresh look. What is really different is that this award has "kick -stand" that allows it to be used with or without a ribbon for total flexibility. Comes in gold finish only with plenty of room on the back for engraving. 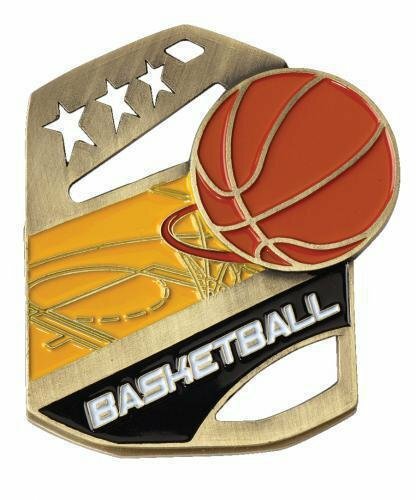 This basketball medallion is truly unique. 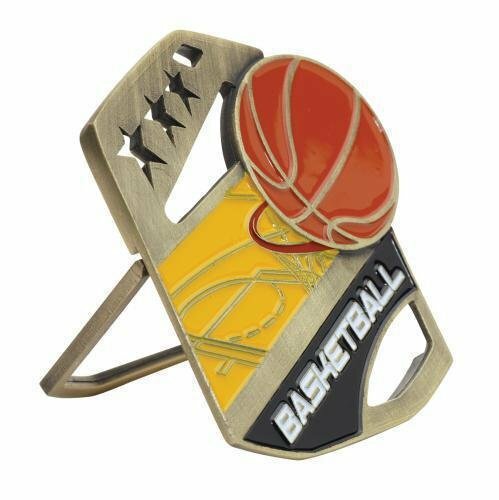 The full color relief of the basketball and the court along with the cut-out of the stars across the top give it a fresh look. What is really different is that this award has "kick -stand" that allows it to be used with or without a ribbon for total flexibility. Comes in gold finish only with plenty of room on the back for engraving. 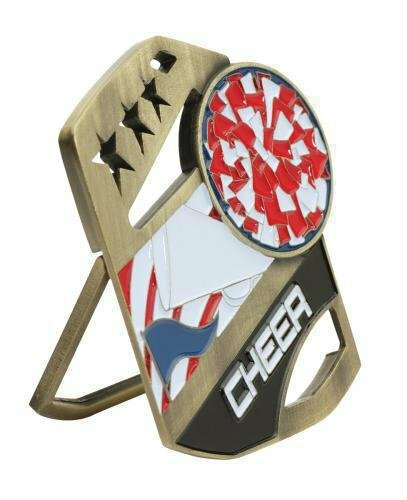 This cheerleader medallion is truly unique. The full color relief of the pom poms, megaphone, and flag along with the cut-out of the stars across the top give it a fresh look. What is really different is that this award has "kick -stand" that allows it to be used with or without a ribbon for total flexibility. Comes in gold finish only with plenty of room on the back for engraving. 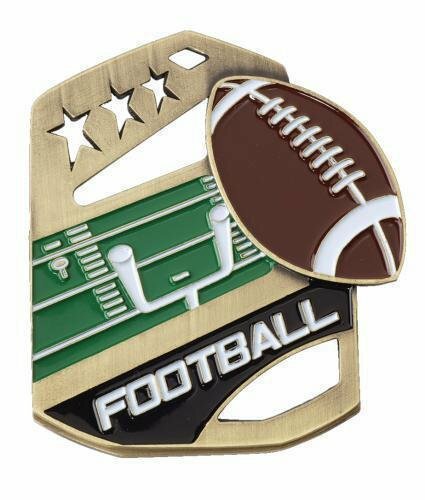 This football medallion is truly unique. 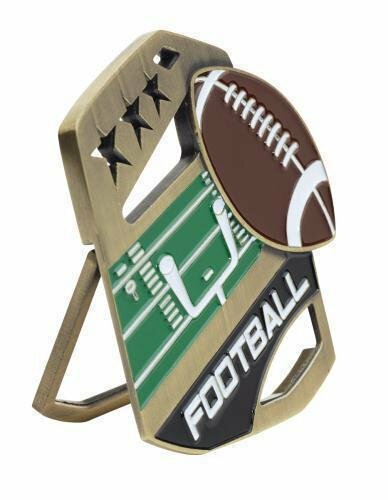 The full color relief of the football and the gridiron along with the cut-out of the stars across the top give it a fresh look. What is really different is that this award has "kick -stand" that allows it to be used with or without a ribbon for total flexibility. Comes in gold finish only with plenty of room on the back for engraving. 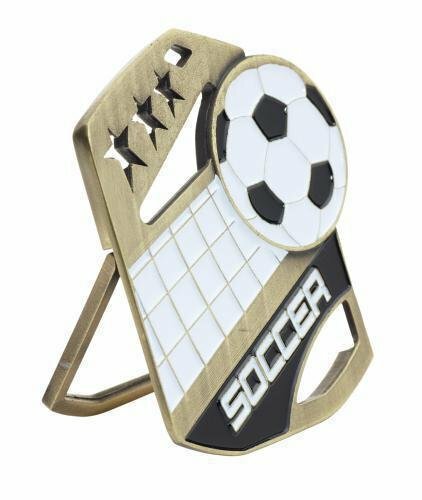 This soccer medallion is truly unique. 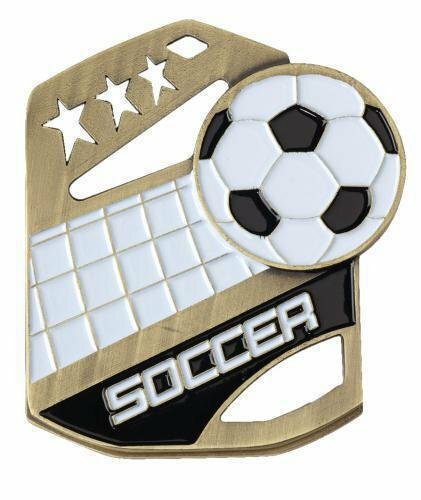 The full color relief of the soccer ball and goal along with the cut-out of the stars across the top give it a fresh look. What is really different is that this award has "kick -stand" that allows it to be used with or without a ribbon for total flexibility. Comes in gold finish only with plenty of room on the back for engraving. 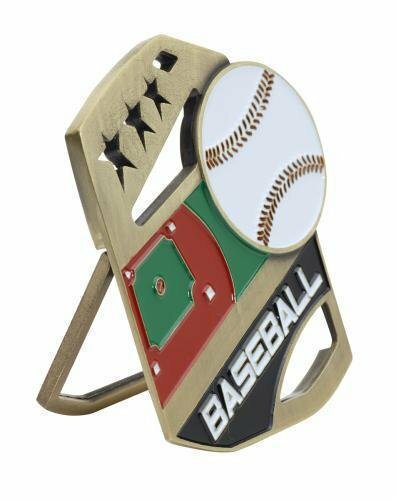 This softball medallion is truly unique. 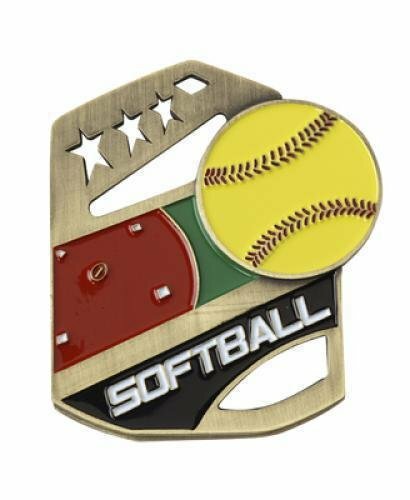 The full color relief of the softball and the detail of the softball diamond along with the cut-out of the stars across the top give it a fresh look. What is really different is that this award has "kick -stand" that allows it to be used with or without a ribbon for total flexibility. Comes in gold finish only with plenty of room on the back for engraving.